Hanshaw, Frank [unclear], head-of-household, age 26, born June 1873 in West Virginia; parents born in West Virginia; married 4 years; occupation: salesman, grocer [unclear]; rented home. Hanshaw, Mar[..unclear..], wife, age 26, born Mar 1874 in Pennsylvania; father born in Ireland; mother born in Pennsylvania; married 4 years; 1 child, 1 living. Hanshaw, George, son, age 3, born May 1897 in Pennsylvania; father born in West Virginia; mother born in Pennsylvania. 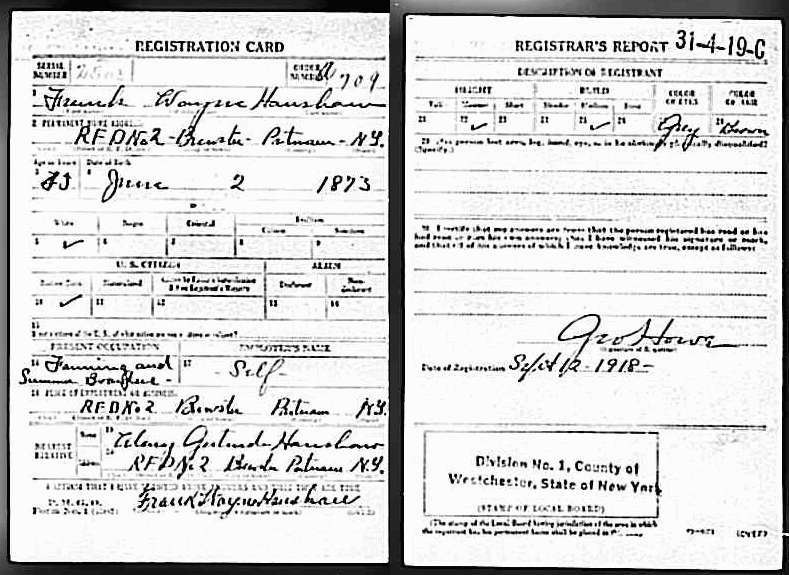 Haller [unclear], Charles, boarder, age 26, born Aug 1873 in West Virginia; father born in Germany; mother born in New York; married 7 years; occupation: book keeper. ", Katherine, wife, age 26, born Dec 1873 in West Virginia; father born in New York; mother born in West Virginia; married 7 years; 1 child, 1 living. ", Carl, son, age 5, born Jan 1894 in West Virginia; parents born in West Virginia. McCoy, M[..unclear..], sister-in-law, age 11, born Jan 1889 in Pennsylvania; father born in Ireland; mother born in Pennsylvania; attended school 10 months. Wright, [..unclear..], [..relationship unclear..], male, age 30, born Dec 1869 in Pennsylvania; father born in England; mother born in Ireland; married 5 years; occupation: book keeper. Wright, Nettie, wife, age 28, born Nov 1871 in West Virginia; parents born in West Virginia; married 5 years; no children. Hanshaw, Harry, boarder, age 33, born Sept 1866 in West Virginia; parents born in West Virginia; married 7 years; occupation: salesman. Hanshaw, Bertie, boarder, age 25, born Mar 1875 in West Virginia; father born in England; mother born in Washington D.C.; married 7 years; 1 child, 1 living. Hanshaw, Lansdale, boarder, age 4, born Jan 1896 in West Virginia; parents born in West Virginia. Henshaw, Frank W., head-of-household, age 37, born in West Virginia; parents born in Virginia; first marriage, married 14 years; occupation: salesman, s[..unclear..]; rented home. Henshaw, Mary G., wife, age 36, born in Pennsylvania; parents born in Ireland; first marriage, married 14 years; 2 children, 2 living. Henshaw, George L., son, age 12, born in Pennsylvania; father born in West Virginia; mother born in Pennsylvania; attended school. Henshaw, Annette K., daughter, age 8, born in New York; father born in West Virginia; mother born in Pennsylvania; attended school. Henshaw, Martha J., mother, age 65, born in Virginia; parents born in Virginia; widow; 3 children, 3 living. McCoy, Nellie K., sister-in-law, age 19, born in Pennsylvania; father born in Ireland; mother born in Pennsylvania; single; attended school. Van Vern, M.V. [unclear], boarder, age 46, born in New York; parents born in Holland; first marriage, married 10 years; occupation: salesman, s[..unclear..]. Van Vern, Frances, boarder, age 30, born in New York; parents born in New York; first marriage, married 10 years; 2 children, 2 living. Van Vern, Henry G., boarder, age 6, born in New York; parents born in New York. Van Vern, Florence, boarder, age 4 months, born in New York; parents born in New York. Hinshaw, Frank W., head-of-household, age 45, born in West Virginia; parents born in West Virginia; owned home (mortgaged); occupation: keeper, boarding house. Hinshaw, Mary G., wife, age 44, born in Pennsylvania; father born in Ireland; mother born in Pennsylvania. Hinshaw, George L., son, age 22, born in Pennsylvania; father born in West Virginia; mother born in Pennsylvania; occupation: clerk, brokers. Hinshaw, Annette, daughter, age 18, born in Jersey [unclear]; father born in West Virginia; mother born in Pennsylvania. Hinshaw, Frank, son, age 4 years 5 months, born in New York; father born in West Virginia; mother born in Pennsylvania. Shutt, Harry, boarder, age 35, born in Indiana; parents born in Indiana; single; occupation: secretary, steamship co.
Floyd, Frank, boarder, age 40, born in Maryland; parents born in Maryland; single; occupation: auditor, tobacco co.
Grendler, Anna, cook, age 35, born in Finland; parents born in Finland; single; occupation: cook, private family. Marnichala, Joseph, servant, age 16, born in New York; parents born in Poland; single; occupation: servant, private family. Hanshaw, Mary J., head-of-household, age 54, born in Pennsylvania; father born in Ireland; mother born in Pennsylvania; widow; rented home ($175 rent); radio in home; occupation: boarders. Hanshaw, Frank, son, age 14, born in New York; father born in West Virginia; mother born in Pennsylvania; attended school; occupation: none, high school. 1920 census, Mount Kisco, New Castle Township, Westchester County, New York; roll T625-1281, ED 105, page 7A-B, line #44, dwelling #116, family #140. 1900 census, Manhattan, New York City, New York; roll T623-1106, ED 548, page 1B-2A, line #93, dwelling #6, family #26. 1910 census, 30th Ward, Brooklyn, New York City, Kings County, New York; roll T624-985, ED 1410, page 70A, line #14, dwelling #131, family #182. 1930 census, Scarsdale, Westchester County, New York; roll T626-1665, ED 348, page 4A, line #12, dwelling #75, family #75. 1880 census, Grafton, Taylor County, West Virginia; roll T9-1414, ED 81, page 313D, line #40, dwelling #261, family #276. 1920 census, Mount Kisco, New Castle Township, Westchester County, New York; roll T625-1281, ED 105, page 7B, line #44, dwelling #116, family #140.